Looking for repurposed furniture projects? If you’re looking to DIY repurposed furniture or find a worthwhile project to do or give your old man for Father’s Day, these ideas will inspire you! Most people like to receive personalized gifts on special occasions and men are no exception. They might not say it, but you’ll know they love it if it’s made with love. This Father’s Day, be sure to give your old man something that he’ll cherish for always. It doesn’t have to be expensive, it just has to be made with thoughtfulness and love. Raid your storage, visit thrift shops, and salvage pallets at the depot to get working on these repurposed furniture projects. Give an inexpensive yet meaningful gift this Father’s Day with a repurposed furniture. 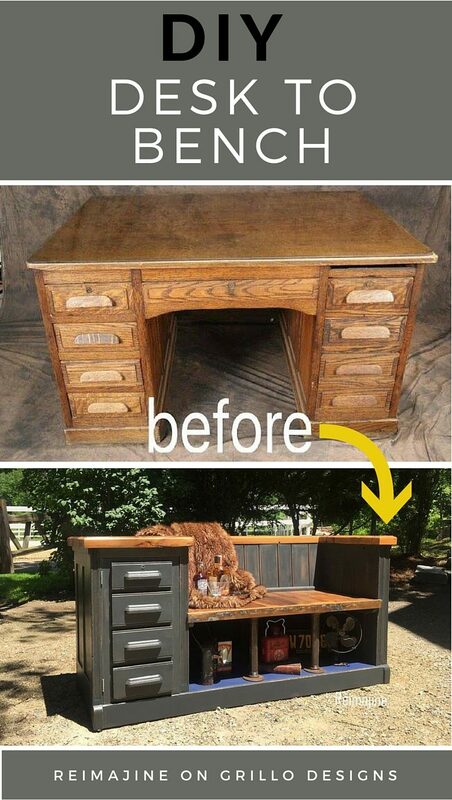 Invite your dad or your kid for some weekend bonding over this DIY repurposed desk project. Don’t throw that old desk away but make something incredible out of it, like this garden bench and organizer in one. Saving yourself and your dad some bucks is definitely a gift to be excited about! Check out the whole repurposed desk idea here. Don’t throw that old wooden bed away, but transform it into an outdoor or garden bench. Take this rustic garden bench inspiration and give your old man a surprise this Father’s Day. Follow the full and detailed tutorial here to get started! Or you can also try this low-budget DIY wooden bench. Great memories are the probably the best gift anyone can give and receive. How about memories presented in this rustic and brilliant glass panel door transformed into a huge picture frame. Take out your best family pictures and get working on this project for your Dad’s day. Get the whole picture for this glass panel door repurposed into a wall decor here. Looking from afar, you won’t probably believe this stylish coffee table was once four fruit crates you would have otherwise thrown out. Now you know you can transform them into this incredibly functional coffee table. 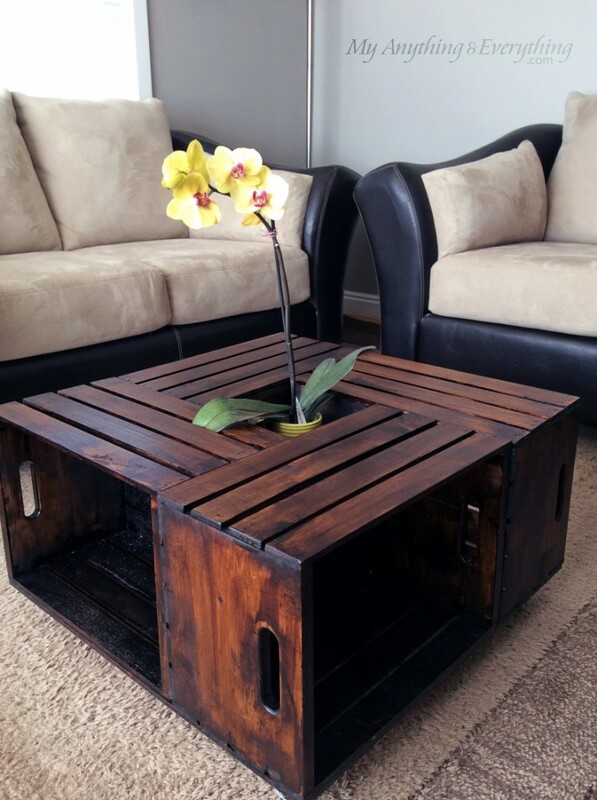 Surprise your old man with this stylish repurposed coffee table. Check for the full details here. Make your Dad proud with your woodworking skills! Take this repurposed door project and transform it into this brilliant shelf idea. Check out the full details for this project here. Building a new room or room extension can be costly. If you’ve got distressed doors in storage, take this divider idea for a low-budget home renovation. I’m sure your Dad will appreciate a good office space without the huge expense. Got an old glass panel window lying around? If you live in an old fixer-upper, there’s no need to throw those original windows away. Take this inspiration for a glass panel window turned cabinet. Find out the full details for this project here. Take this simple yet unique inspiration for a repurposed furniture set. Your Dad’s man cave will certainly be looking cool and manly and not dark and dingy with this sofa set. It’s amazing how window shutters make a perfect door for a cabinet. Get working on this repurposed project with your old man, or if you’re a Daddy yourself, make a DIY repurposed cabinet for the family. You can follow the full details for this project here. What best gift to give dad but a convenient drinking buddy in this cooler stand. Whether it’s a summer barbecue or an outdoor party for the 4th of July, this cooler stand will rock. I’m sure your old man will be proud of both you and his new cooler stand. Make a DIY cooler stand with this guide here. I’m pretty sure you’re not lacking in used tires lying around your garage. Good thing, used tires make durable and functional stuff around the household including furniture. Take this rustic used tire coffee table, for example. I think Pop will definitely dig this. Check out the full tutorial for a used tire coffee table here to get started. Don’t you find these repurposed furniture ideas cool and exciting? I’m pretty your ol’ man will appreciate working on these projects with you or receiving the fruit of your creativity and labor as a present. On the other hand, if you’re a dad yourself, you can work on these ideas for your pleasure. Revamp your man cave with these repurposed furniture ideas just in time for Father’s Day! 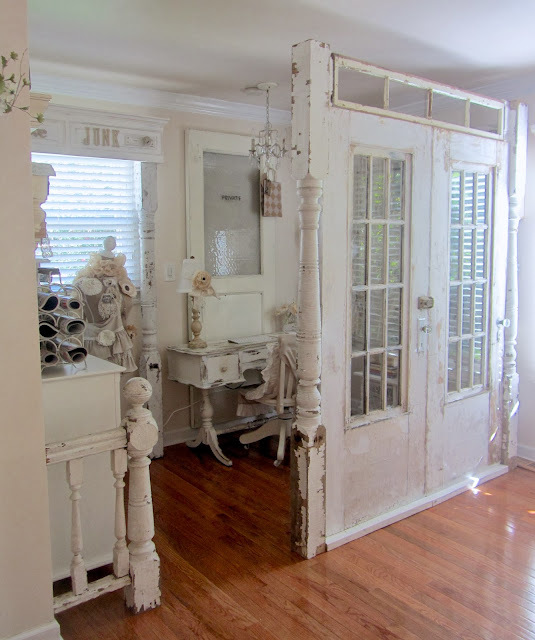 Are you going to give these repurposed furniture ideas a try? Let us know in the comments below! You might want to give this DIY garden shed project a try for your homestead.